Here’s why: Our nation’s aviation industry supports almost 12 million jobs and over $1.5 trillion in total economic activity, and accounts for 5.4 percent of our GDP. In other words, the U.S. aviation industry is a big deal. There’s a reason that America’s aviation sector is such an economic powerhouse. It is governed by strict laws, trade and collective bargaining agreements that, for decades, have ensured that the industry is a hub of good, middle-class jobs, economic expansion and fair competition. But a pending application by Norwegian Air International (NAI) to launch new U.S. air service could change all of that. What makes this case — which is now pending before the U.S. Department of Transportation (DOT) — so unique is that NAI’s business model is designed to game our trade rules, undermine the rights and livelihoods of U.S. and European airline employees and undercut fair competition by scouring the globe for the lowest labor standards possible. Here’s how NAI’s scheme would work: The airline, which is Norwegian in name only, will be a subsidiary of Norwegian Air Shuttle (NAS). Even though NAS is based in Norway, NAI will be headquartered in Ireland. NAI will employ flight crews under short-term Singaporean or Thai employment contracts. You guessed it: All that globetrotting allows NAI to evade the strong employment and tax laws found in Norway and across much of Europe, and instead capitalize on weak regulations and labor standards. Here’s the real kicker: This flag-of-convenience business model blatantly violates the labor article negotiated into the 2010 U.S.-EU Open Skies Agreement, which states that the “opportunities created by the Agreement are not intended to undermine labor standards or the labor-related rights and principles contained in the Parties’ respective laws.” That’s why members of Congress on both sides of the aisle and other key political figures — including Democratic Presidential Candidate Hillary Clinton — have staunchly opposed NAI and its perverse plan. And if you think this flag-of-convenience model is just a new innovation in business that deserves a chance, think again. The very regulatory scheme that threatens our aviation industry was introduced to the U.S. maritime sector in the 1950s. The result? Our maritime industry and workforce were gutted. The once world-leading U.S. merchant fleet shrunk from more than 1,000 oceangoing vessels in 1955 to fewer than 100 today. Tens of thousands of solid, middle-class jobs have been lost as U.S.-flag ships that play by honorable rules are forced to compete against ships that employ crews from some of the least-regulated, lowest-wage nations in the world where exploitation of crew members is the norm. The bottom line is that if NAI is allowed to serve U.S. cities, the U.S. aviation industry will never be the same. A DOT decision that approves NAI’s application will open the door to a generation of bottom-feeding air carriers that violate our trade rules and destroy high labor standards. Sanctioning NAI’s perverse business model is no way to honor the achievements in flight made by this country. It’s no way to treat an industry that is so critical to our national economy. And it certainly is no way to thank the hardworking, dedicated employees who keep the world’s busiest and most complex aviation system safe and operational. Fortunately, the Obama Administration is giving NAI’s application the thorough scrutiny it deserves. 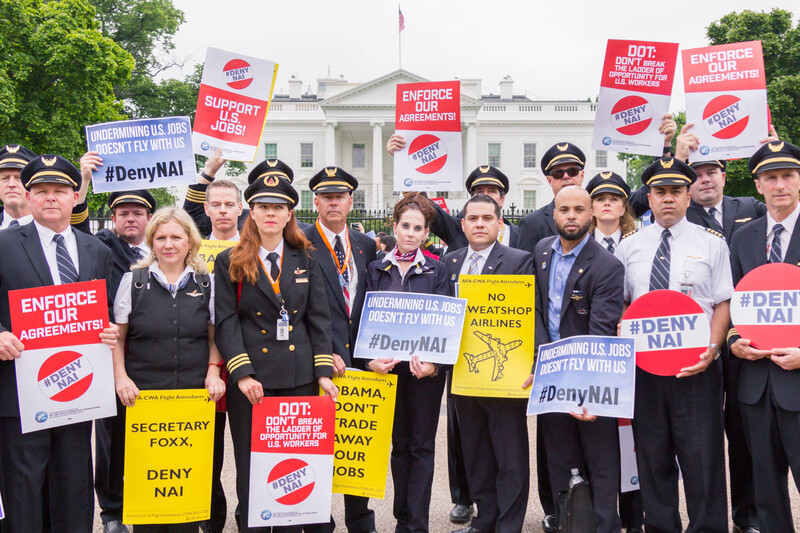 But the best way to honor National Aviation Day is for our government to #DenyNAI and send a clear message that our trade rules matter and will be enforced.